"The Game" - Electroformed copper over resin and marine grade stainless steel armature. Suitable for indoor display and seasonal outdoor display in good weather (protect from frosts/snow). Wall-mounted (fixings are in the back of this relief sculpture). Also can be produced in the following finishes to order:- foundry bronze (antique patina), foundry bronze (highly polished patina) - both of which can be displayed outdoors all year round; cold cast bronze, copper, iron, aluminium, brass; drizzled pewter, drizzled pewter mixed with cold cast iron; resin in a variety of colours, engraved cold cast metals, decoratively hand-painted aggregates, coloured artisan concrete (suitable for outdoor display). 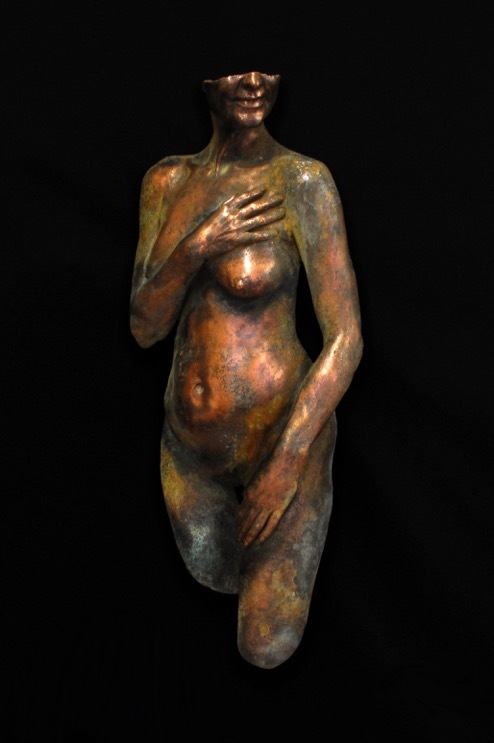 This versatile piece was designed as part of a series of nine lifesize copper nudes, depicting different moments in the story of Voltaire's 'Candide', reflecting the hero's obsession with the lady Cunégonde. His passionate desire for the sensual object of his attention makes it hard for him to focus on her as a complete person, and so he is teased with fleeting fantasies of her body in fractured form as his obsession moves around her body until he finally unites with her. This sensual sculpture, reflects a rather cheeky moment when the heroine is coyly aware of Candide watching her bathing, and is pretending to be shy. The original (shown here) in electroformed copper with a multi-tonal antiqued patina is a one of a kind piece, priced at £6000 (not including delivery/installation if required). Based on a cast of a living model of 5'8" in height, the dimensions of this piece as a complete ensemble are approximately 400x1040x350cm, copies in other materials are in limited editions of nine - costs and production times vary. 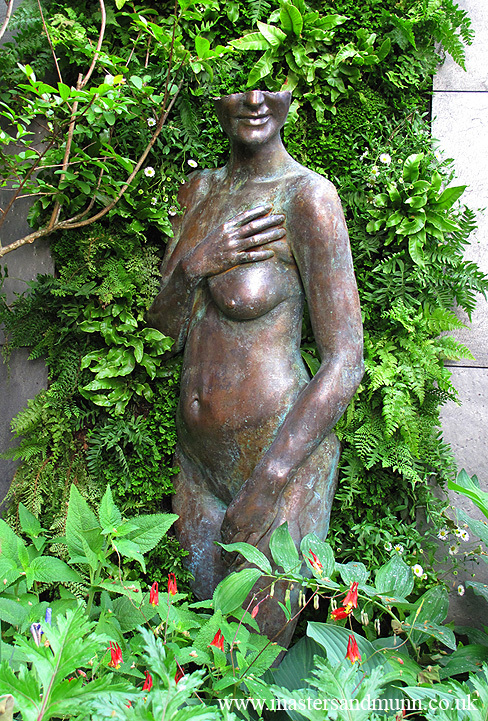 This piece has been shown at the RHS Chelsea Flower Show in Thomas Hoblyn's Foreign and Colonial Garden as part of 'The Cunégonde Collection' in the Foreign and Colonial Garden, helping to win a Silver Gilt Medal for the garden, as well as being exhibited at Godinton House, Kent. This piece can be easily packaged for safe transportation overseas.